- Publisher Employing Kierkegaardian categories and analysis, this study investigates both the central crisis in William's authorship between pagan hermetism and existential Christianity and the quest to resolve this crisis, a quest that ultimately presses the bounds of orthodoxy. 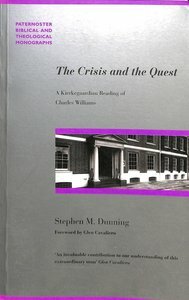 About "The Crisis and the Quest (Paternoster Biblical & Theological Monographs Series)"
Employing Kierkegaardian categories and analysis, this study investigates both the central crisis in William's authorship between pagan hermetism and existential Christianity and the quest to resolve this crisis, a quest that ultimately presses the bounds of orthodoxy. Stephen M. Dunning is the associate professor of English at Trinity Western University, Canada, and received his doctorate in English Literature at the University of Cambridge. The author takes up Niebuhr's theology and presents it to be, at its heart, an attempt to grapple with the most powerful and most dangerous aspect of human nature: a quality Niebuhr describes as 'the will-to-power'. Lovatt argues forcibly that Niebuhr identifies the fundamental nature of human sin as having very specific qualities; and that Niebuhr, over his various works, develops a theology which seeks to deal effectively with this quality, both theologically and practically. Lovatt discusses the main areas of doctrine covered by Niebuhr, and considers how his position reflects his underlying agenda to grapple with the reality of the will-to-power. This leads to some important conclusions about Niebuhr, modern theology, and the present-day problem of evil.